If you are expecting some second-rate compositions from a dashing 18thcentury prince, then prepare yourself for a wonderful surprise. Prince Louis Ferdinand was born in November 1772 and died fighting in October 1806 in the battle near Saalfeld. But although this untimely death cut short a brilliant career, he still left his mark, both as a soldier and musician. As befitted his position, Louis Ferdinand pursued a military career and soon his bravery and audacity made him a heroic figure for many an officer. Good natured and extremely handsome, the Prince was able to mix freely with the great figures of his time, and his cluster of admirers increased by the day. After his tragic demise Prince Louis Ferdinand was revered as a true gentleman and a figure of paramount importance for the Prussia of his time and afterwards. He was a consummate composer, a brilliant piano player and an ingenious innovator. In spite of his modest output, Louis Ferdinand is regarded as the first to compose for the piano septet and octet mediums. His influence left its mark on such giants as Chopin, Weber, Mendelssohn and Schumann with the latter even raising him on the same pedestal as Schubert's. Many critics agree on the fact that the Prince should be seen in relation to Beethoven, whom he knew in person and also greatly admired. Their mutual esteem was deep indeed and they both came to appreciate each other's abilities. Such was their friendship that Beethoven dedicated his Third Piano Concerto to the Prince. It is also assumed that the "Eroica" is dedicated to Louis Ferdinand as well. The music on this first volume is an absolute joy, well crafted, witty and very often extremely virtuosic, it is a real feast for the ear which ends only too quickly. 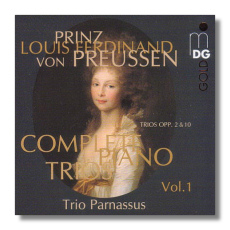 The Trio Parnassus have established an incomparable reputation for this kind of repertoire, and their previous MD&G recordings have come in for high praise, particularly their pioneering Lalo and Rheinberger sets. This CD will certainly raise their stock higher, as I found these interpretations wonderfully articulate and passionately expressive. Their balance and attention to detail are also prime demonstrations of their total fidelity to the scores. Presentation, sound and notes are in the best MD&G tradition. I'm looking forward with eagerness to the next volume.